New Era offers a full line of purpose built flame laminating units. 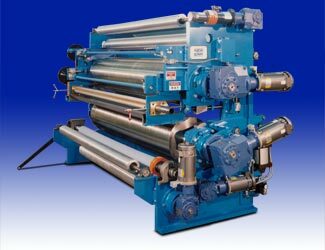 These systems are available in two ply and multiple ply configurations and can be provided to meet your web width needs. Customer’s often have special needs which require specially designed equipment. These boxing/festooning systems allow a customer to feed and pack a continuous web of material into a shipping box. In this application, New Era’s design team worked with the customer to engineer a solution matched to their needs. Customer’s often have special needs which require specially designed equipment. This conveying system allows a customer to deliver a delicate web between process sections. In this application, New Era’s design team worked with the customer to engineer a solution matched to their needs. New Era has experience with providing a wide variety of coater enclosures for environmental control and operator comfort. Each enclosure is engineered to match both the application and customer’s needs. Customer’s often have special needs which require specially designed equipment. New Era’s design team has experience in working with it’s customers to provide coating pump and delivery systems designed around the application needs.